The crash of Amtrak Northeast Regional Train 188 in Philadelphia, PA on May 12, 2015 involved an Amtrak passenger train, but in many ways this train crash was like a plane crash, specifically in the ways that the major US media outlets responded to the event. It is extremely rare for train crashes to generate intense media interest, but this kind of attention is routine for airline crashes. 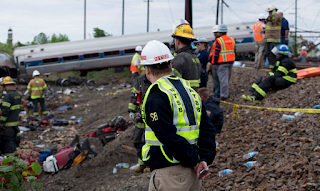 Upon closer review, the media response to the Amtrak crash is not so surprising. Although it has only been a couple of days since the crash, the NTSB accident investigation team has revealed key details of the events that led to the crash. In short, it looks like the train was traveling just over 100 mph (161 kph), and derailed after entering a curve that had a 50 mph speed limit. There were five crew members and about 240 passengers on board. Seven of those passengers were killed, and several dozen passengers and crew members were injured. While this accident has received the kind of attention usually given a major plane crash (for example, continuous coverage from major news networks that includes having news anchors at the crash site), Amtrak accidents are actually quite common. 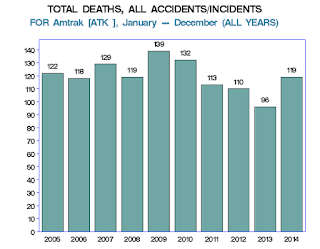 According to the Federal Railroad Administration, over the last decade, Amtrak has been involved with accidents and incidents that have resulted in over 1,000 deaths. 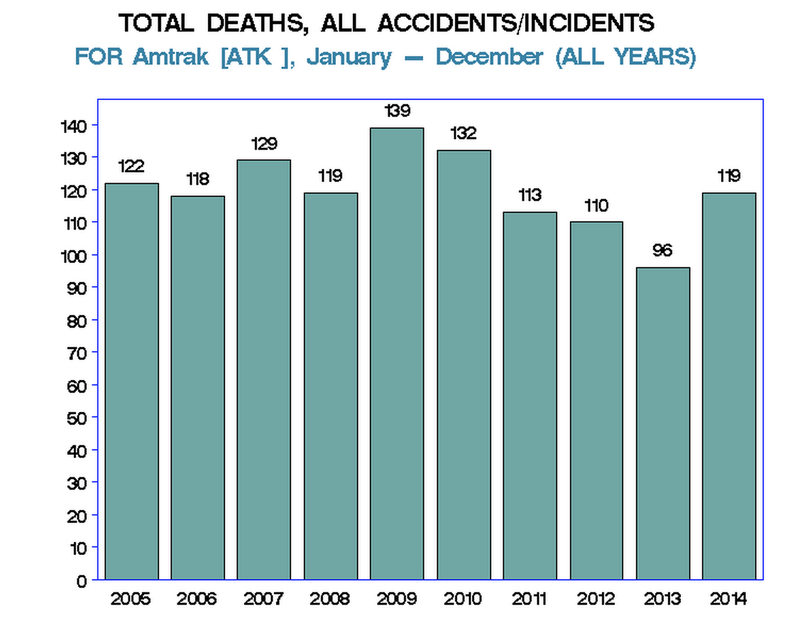 In the last three years, Amtrak has been involved in over 50 accidents per year, with 21 in the first two months of 2015. The circumstances around the Philadelphia crash that have led to an intense amount of media attention include where it happened, who was on the train, and perhaps more importantly, who is likely to travel by train on that route. The crash took place on not only the most heavily traveled route in the Amtrak system, with over 12 million riders in 2011, it is also a route that connects New York City with Washington, DC, two metropolitan areas where many members of the US financial, political, and media elite live and work. Given the ongoing media coverage, it is very likely that the most influential business, political, and media decision makers throughout the US are not only keenly aware of the accident, but can also imagine circumstances where they could have been on that train that night. If it had been a jet airliner traveling between major cities in the northeast US, the airliner's passenger list would have likely reflected the profile of the people on that Amtrak train. These are the reasons why the traveling public, especially the more influential members of the traveling public, may feel about this train crash the same way they would perceive a plane crash, as something that could happen to them. If it bleeds it leads! Simple as that! The media are like ticks on a dog with this type of accident, they love it! Great crash pictures, massive human error, deaths etc. What more could you ask for to sell your papers and boost your TV ratings! Of all of the Amtrak (or other railroad) deaths, how many of them are at railroad crossings involving a vehicle on the tracks, which often are either disobeying the crossing signal, or are parked on the tracks as the signal goes off? Operation LifeSaver has some stats that may help shed some light on that. This is usually the kind of news that the TV prioritize to report than the state of economy which is a bigger problem than this kinds.